The rapid growth of startup company statistics in the real estate financing sector demonstrates that interest in crowd financing opportunities is increasing throughout Europe, including the Baltics. Several mistakes are made in the development of various new projects, which is having a negative impact on the real estate market. To obtain financing, property developers usually choose to attract a strategic partner/investor, meaning they typically are required to share up to 50% of their profits. Nevertheless, it is the entrepreneur who is the one who has to executes the project’s work, yet while only receiving half of the profits, as the other half is paid to the investor. Crowdfunding platforms are turning this situation on its head because developers only repay a specified interest rate on the loan amount, regardless of the amount of profit they make. With the increase in alternative financing, it is no longer necessary to postpone new developments until the previous project gets entirely sold out to purchase and begin work on the next property. The short-term bridge loan is especially suitable for cases where it is necessary to release frozen funds in a project to begin a new one, or for increasing the company’s operating capital. Taking an example from the EstateGuru portfolio, when a bridge loan is used in a sales period, known as a Siguli loan – the borrower raised €200,000 for the Mardi apartment building loan for the sales period, attracting more than €1 million for releasing capital whilst selling 100 apartments. Developers typically choose not to begin advertising whilst projects are under construction, but experience from these cases are when marketing campaigns start at a projects early stage, they significantly contribute to bigger sales volumes, suggesting that it is invaluable to offer prospective customers an overview of upcoming properties and even the possibility to reserve the right to purchase. Attracting funding for EstateGuru means not only obtaining funds quickly and on flexible terms, but also additional valuable marketing. The number of registered investors in the platform exceeds 12,500; typically investors are interested in purchasing property or recommending their friends and colleagues thereby increasing potential sales results. 4) If the bank said no – there is no option! It is never pleasant to receive a refusal, especially if the refusal is from a bank. 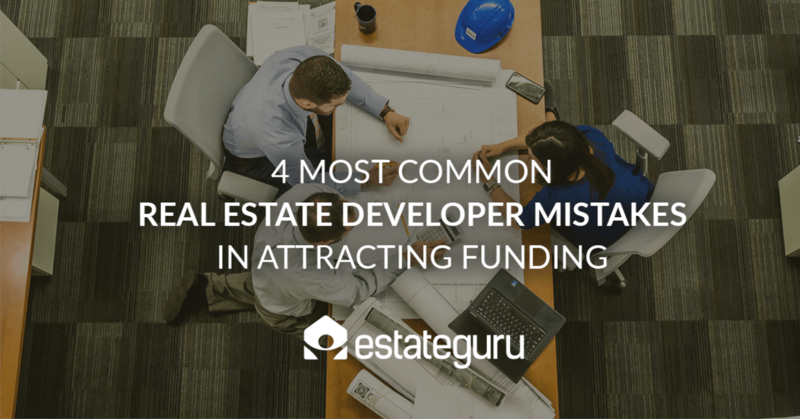 For developers to implement a dream project, it must be understood that there are various alternatives to solving the funding situation. The bias towards short-term financial solutions must be discounted – crowd financing does not have to be a substitute for a bank; but can serve as a pleasant addition. One of the most popular loan transaction models on the crowdfunding platform is precisely the funding provided for refinancing – the funds are raised for a period until the necessary formalities for a bank loan are arranged. With the option to repay the full amount of the loan and interest payments at the end of the loan period offered by EstateGuru, it is possible to refinance the loan with the bank without any unnecessary inconvenience. If you’ve once made some of these mistakes and want to apply for a free consultation, contact EstateGuru’s experts. The EstateGuru crowdfunding platform is established by real estate developers, and the team employs experienced industry professionals, who can objectively examine a project’s full potential and offer the most advantageous solution with flexible and individually adapted conditions.